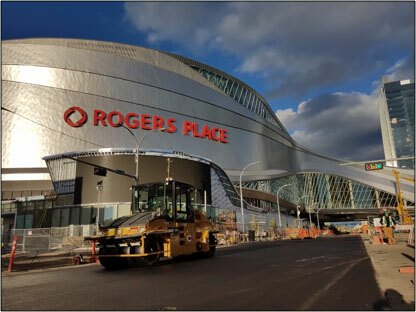 Carmacks entered into contract with PCL late summer of 2015 for the landscape and civil works of the newly designed Rogers Place, the much anticipated home of the Edmonton Oilers. The scope of work is defined as a prime contractor with several sub trade disciplines under the management of Carmacks. The original schedule called for two years of construction but due to major delays in the final design along with various contractual agreement delays the work could not start until the fall of 2015. These delays resulted in squeezing the majority of the work to the 2016 season forcing us to proceed with the deep underground work during the winter of 2015/16. The project started with two storm main installations with corresponding manholes and catch basins. A 250mm water main service and four hydrants were installed during the winter months. Once spring arrived the surface work took off at full strength with excavation and building base for the concrete work to follow. Early to mid-summer prompted the start of shallow utility work. Jatec, the electrical contractor, constructed all electrical trenching and conduit installation including erecting light poles up to the end of October. The road construction was completed in several mobilizations with the final lift asphalt being placed in early November. The concrete scope had a full presence on site from spring to late fall, even though early winter with the added complications of freezing temperatures and snow. Landscape work started in August with trees and shrubs in several beds constructed earlier and completed in November with site furniture. The principal obstacles faced during this project were the multiple trades outside of Carmacks umbrella working diligently to complete the outer shell of the building. We dealt with this factor with daily production meeting. Hosted by Carmacks, attended by PCL representatives and all trades under Carmacks, we safeguarded efficient work progression coincided with forward planning to capitalize on the site restrictions. This resulted in regular changes to the direction the work was heading. Carmacks subcontractors and internal forces learned to adapt to this site as they were often redirected to alternate locations to accommodate the needs of the project as a whole.